An arcade twin shooter game with tower defense elements. You play as a child fighting monsters at night. During the day you prepare for battle by building and upgrading your base and placing towers. Once the night falls, you shoot everything that moves. Sleep Tight is a twin stick shooter with significant tower defense elements. It is the first production by We Are Fuzzy, although the members of the studio are experienced, having worked on such games as Far Cry 5 and Titanfall, as well as TV series Westworld and Game of Thrones. You play a child harassed by monsters every night. Eventually, he becomes fed up and decides to fight back. To succeed, he needs the objects in his room, which he can use to build a base. You build the base during the day, using e.g. pillows. Behind the “walls” you put toy towers and prepare for battle. When night falls, the monsters arrive in one-minute waves. You defend yourself by staying in the base and shooting everything that moves with the help of your towers. You can also run around the room, distracting the monsters from attacking the base and fighting on their turf. If you survive the whole night, you earn rewards, upgrade your weapons (including a dart gun or a water gun), repair the damage, and prepare for the next fight. 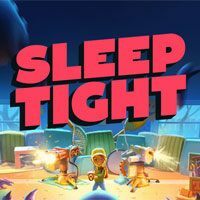 Sleep Tight is ta game for both adults and children. The production features cartoonish visuals, and the monsters are not too scary. The game is very dynamic, as the projectiles fly all over the screen and everything happens very fast.